The MADACC Run: I did it! I survived the MADACC Walk, Run, Wag! 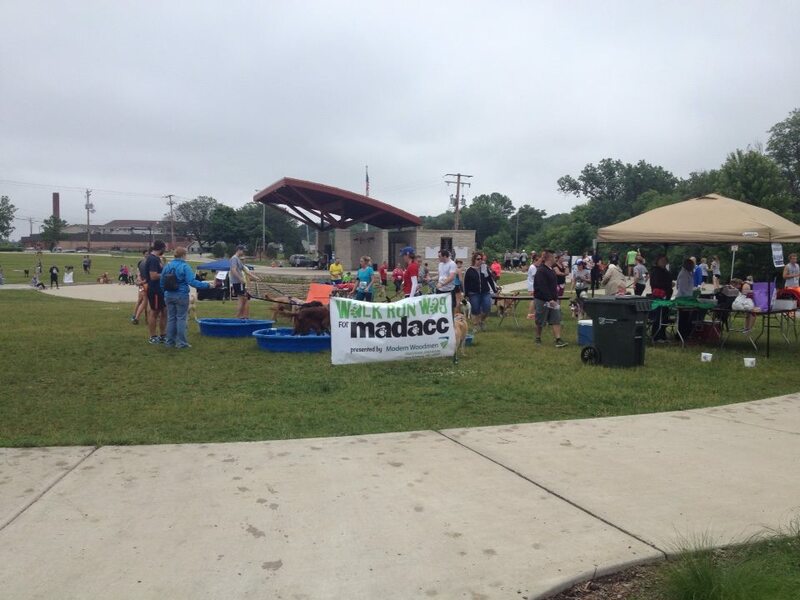 This was a fun run/walk for the Milwaukee Area Domestic Animal Control Commission. They take care of the area’s neediest animals. 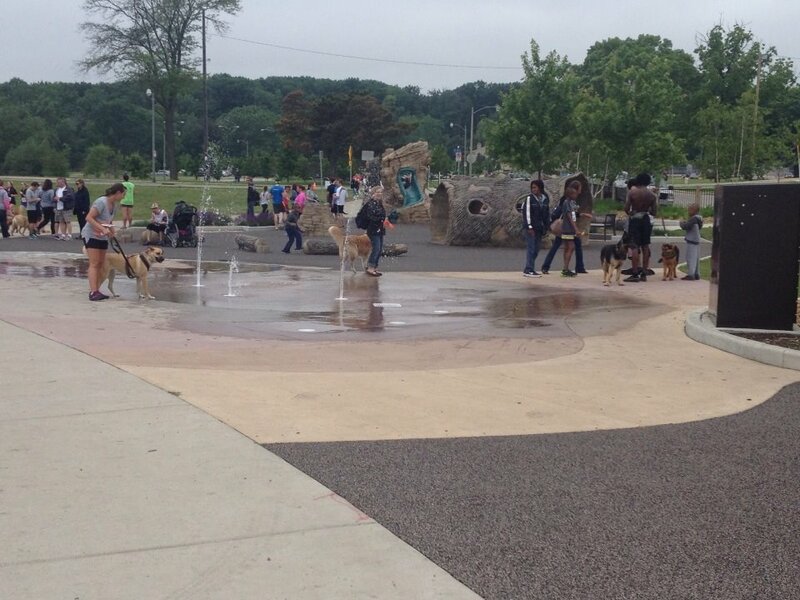 This is where I adopted Grizzy, and Sophie started out at MADACC as well. I’ve been there several times and have been so impressed by the kindness and dedication of its employees and volunteers. I am very happy I was able to participate, and thank you!! to everyone who helped me fundraise. You helped an amazing organization continue to do great work. On to the run itself! It was a super fun run. 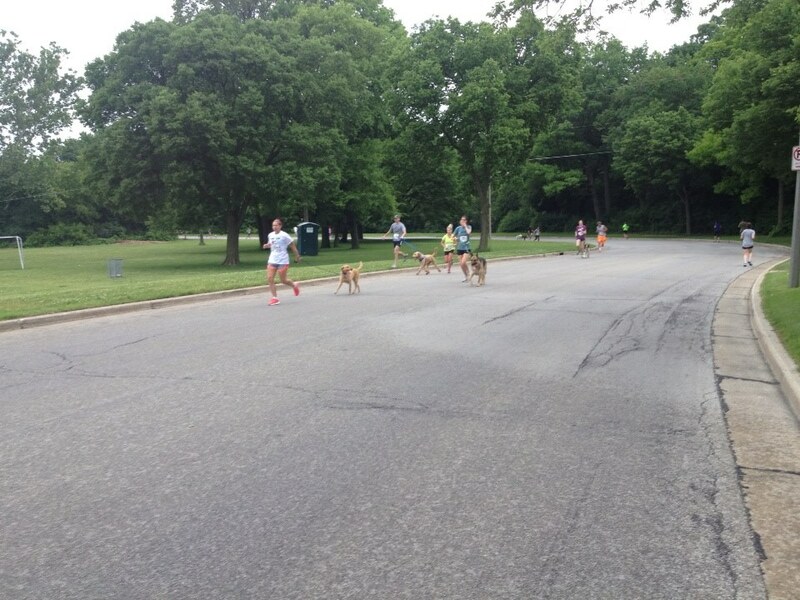 There were runners, there were runners with dogs, there were walkers and walkers with dogs. I highly recommend it. It was well organized, there was some great music afterward, there were booths with local vendors and associations, and it was just great fun. During the run. 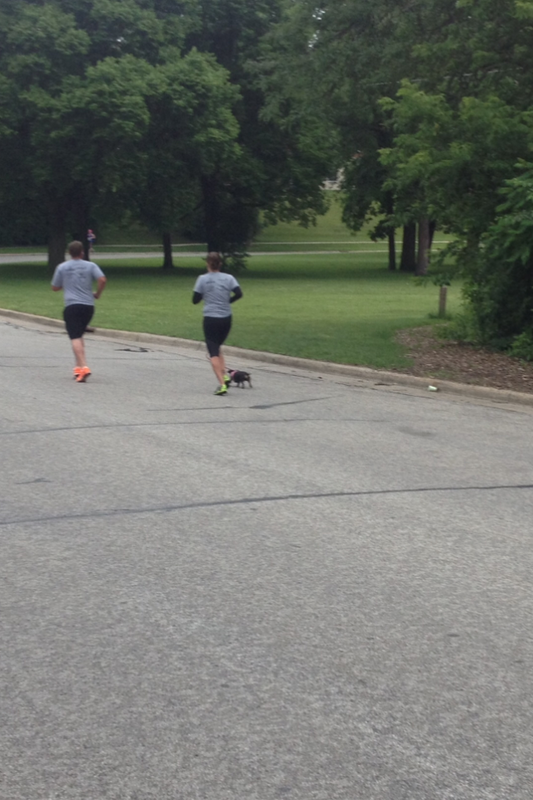 The “dog racers” started 15 minutes after us, so we got to see a bit of their run. I saw this guy at the start of the race and I was lucky enough to see him cross the finish. What a champ! Me and Peg after the finish. Needless to say, I didn’t make my sub-30 race; however, I’m pleased with my times! There were a couple hills, which is always tough; I need to start incorporating them into my runs. I am really pleased that I came in 22 in my division (middle-aged women, haha) and 88 overall. I’m sure that lands me squarely in the middle or lower-middle, but it sounds impressive! I’m not a marathoner by any means. Some years back I was serious about running a half marathon but now…not so much. I honestly think I’d get bored. However, I would like to do a 10K at some point, just to say I did it. I’d also like to get back to a sub-30 5K, so that’s another goal. Another thing that was really cool is the race leader cheered us on. Now, the race loops around, so we were going up the hill and this due was coming down–after running around the top of the hill for a time–so he was FAST. He was battle ready, totally driven, which always gives me a bit of awe to see people so focused like that during a race. Anyhow, as he ran past us, he yelled some encouragement, which was so cool. Granted, I’m sure he was aiming it towards the two 20-somethings in front of me, but it’s so nice to hear that kind of encouragement. I love that about runners. As Peg joked, “The thing about running is, everyone wants to know races, injuries sustained, times. 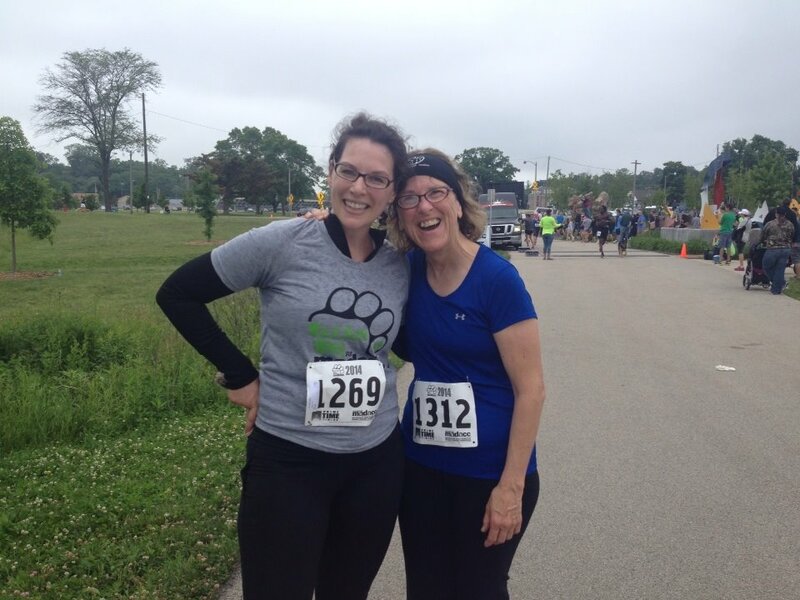 I just like my 5Ks!” I think the one injury I sustained was pulling my ACL because I didn’t stretch before a run! And my times, eh, not the best. But I love that no matter how slow you are, or how little you run, runners are generally very supportive and good about cheerleading each other. Maybe because they know that sometimes you don’t get that runner’s high and sometimes it’s tough to get out there? This is definitely a fun run and it supports such an important cause. I will definitely do this again next year! Congratulations on finishing the run!